U.S. Secretary of State Rex Tillerson leaves the country. The State Department had billed Secretary Rex Tillerson's first diplomatic trip to Africa as a mission to reaffirm U.S. collaboration with the continent on counterterrorism, development and good governance. Tillerson's abrupt dismissal Tuesday, just hours after returning from his weeklong tour of five countries, raises questions about the strength of any commitments he made there, several longtime Africa observers say. "I don't know how the Africans are going to take that," said John Campbell, who served as U.S. ambassador to Nigeria from 2004 to 2007. Campbell, an Africa scholar at the Council on Foreign Relations, noted that Tillerson's trip had represented "a bit of fence mending" following U.S. President Donald Trump's alleged description two months ago of African nations as "s---hole countries." Trump's sacking of the top U.S. diplomat could be interpreted as "another example of the administration disrespecting Africa," Campbell said. "What, after all, do the various assurances that presumably the secretary provided during his meetings – what does that mean when he gets fired?" Nigeria was one of the stops on Tillerson's Africa tour, which also took him to Chad, Djibouti, Ethiopia and Kenya. His first stop was Ethiopia's capital, Addis Ababa, where he met with dignitaries including the head of the African Union Commission. Moussa Faki Mahamat, in a March 8 Twitter post, said they'd had "fruitful discussions" on peace and security, "including AU-led initiatives to fight terror. …"
VOA could not reach any AU representative for comment about the implications of Tillerson's dismissal, nor had the organization posted any public statement on social media as of midday Tuesday. Ethiopian government officials also declined to comment. Just before undertaking his trip last week, Tillerson announced $533 million in humanitarian aid for Ethiopia and some other African countries. But, as a Brookings Institution analyst observed, the Trump administration had not proposed any new initiatives. 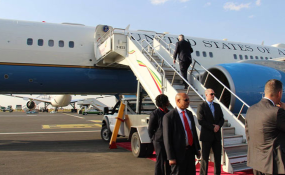 "It is unusual for a secretary of state to make a trip like this and to have no deliverables," Witney Schneidman, a nonresident fellow with the institution's Africa Growth Initiative, told VOA last week. Impact on Chad's travel ban? In Chad, Tillerson had praised the country's "positive steps to strengthen control over its passports and improve information-sharing," suggesting the changes could lead to its removal from a list of countries whose nationals face a broad ban on entering the United States. The Trump administration put Chad on its travel ban list last September. Evariste Ngarlem Tolde, a political scientist with the University of N'Djamena, speculated that the U.S. might eventually lift the ban on Chad. Tillerson "came to Chad because the U.S. president sent him," Tolde said to VOA. "So everything he said is going to be accomplished." Melvin P. Foote has a different view. The founding president and CEO of the Constituency for Africa, a Washington-based organization that promotes public-private partnerships with the continent, said that with Tillerson's firing, "I don't see a way forward. I don't." Foote, appearing on VOA's "Africa 54" TV show, said he believed the move would diminish U.S. influence – already outpaced by China and Russia – on the continent. "I don't hear anything that says we have a coherent strategy with Africa," he said. VOA French to Africa correspondent Andre Kodmajingar contributed from Chad; Hausa Service's Mahmud Lalo contributed from Washington.